Expect more racing action on September 22, 2018. Coming from an action-packed second round, which was held in the streets of Alabang, the third and final round of the Toyota Vios Cup Season 5 is set to happen on September 22, 2018 at Clark International Speedway, Pampanga. 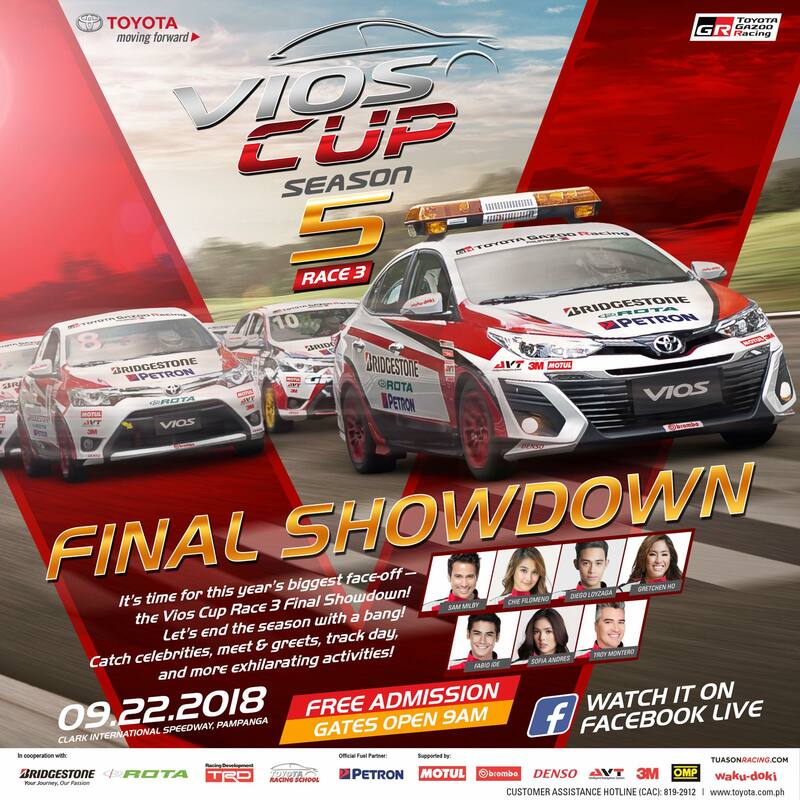 53 racers composed of 46 drivers and 7 celebrity racers will continue to battle each other, claiming once and for all the victory, which will be crowned as Champion for this season’s Toyota Vios Cup. Witness Sam Milby, Diego Loyzaga, Sofia Andres, Chie Filomeno, Japanese-Brazilian model Fabio Ide, Sportscaster Gretchen Ho, and actor Troy Montero try to outpeform each other as they battle on which celebrity should be crowned as Champion for this season’s race. Toyota promises nothing short of an entertaining and spectacular performance for fans and spectators alike. Keeping everything alive and well are racers & motorsports enthusiasts, James Deakin and Gaby Dela Merced, whom will be hosting this season’s finale. Gates open at 9:00AM. Be there to meet & greet your favorite racers and watch them race up to 5:00PM.